Closed captions are an important piece of video accessibility. In order to meet the requirements specified by the various US laws you may want to improve the quality of automatically generated captions. The IBM Watson Media Caption Editor is a smart tool that will help you do this job in the most effective way possible. 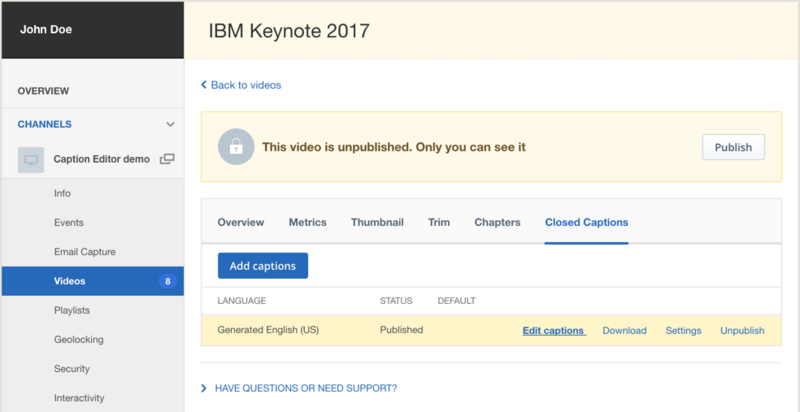 If you successfully set a Watson supported language to your video you will find generated captions on the video's Closed Caption tab. Hover your mouse over the row and buttons will appear on the right. To review and correct automatically generated captions choose the "Edit captions" option. Please note that captions that have failed, are low confidence or in generating/processing state cannot be edited. Entering the Caption Editor interface, you'll see a video player on the left and the IBM Watson generated captions as a text area on the right side. Some words will be underlined. This emphasis indicates where the automatic transcription has a low confidence level and so some corrections might be needed. However, not all of the underlined words are improper. In addition, there might be errors in the text in other places too. Quality of the generated captions depends on a number of factors. Read more about this topic in this article. Start playing your video, and captions will appear on the player right away. You can follow the speech in the text area cue after cue. The speech section that is playing will be highlighted in yellow. Listen to the speech carefully while reading the captions. If you find a mistake or a difference from the spoken speech click on the word and edit it just like in any standard text editor. Playback will stop as soon as you start typing. Unedited autogenerated captions contain few punctuation marks as it is hard to identify sentences in spoken language. Add commas, periods, and other punctuation marks to the text as necessary. As soon as you add a period to end of the sentence, the next letter will automatically turn into upper case to begin the next sentence. Your captions are already arranged in rows of different lengths, based on the rhythm of the speech and grammatical rules. However, you can manually add or remove cue breaks anytime by hitting Enter in the cue, and Backspace at cue start. Backspace will pull up one word at a time into the cue above. Video and captions will stay synced even after multiple line breaks. If a cue becomes so long that it would cause reading difficulties for viewers, excess words will turn into red. Consider a line break in the specific section. Repeat once: You can listen to a specific line again by clicking the button appearing at the cue start. Scroll to current cue: It will always take you back to the exact time where the speaker is talking. You can secure your edits anytime by clicking on the Save button. To make the edited version of your captions available for your viewers, please follow these steps. If the captions were published while editing, your changes will become available once you have closed the Caption Editor. If captions were unpublished while editing, your changes will become available when you publish the captions. It is also recommended to save a copy of your changes in a text editor while editing, just in case if your session has been interrupted by an issue (e.g. page freezes or disconnection from your network, etc. ).